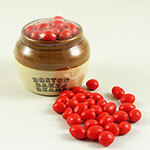 Boston baked beans candy in clear acetate box. "Boston" is printed in gold letters on the box. 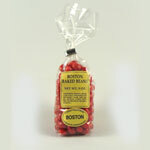 Label reads "Boston 'Baked Beans'". Contents: 5 oz. Box dimensions: 5 1/4" x 2 1/2" x 3/4".